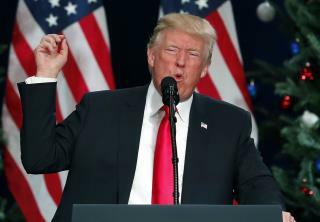 (Newser) – President Trump fired back at Theresa May on Wednesday after the British prime minister condemned his decision to retweet a far-right group's anti-Muslim videos—but he started with the wrong Theresa May. "Don't focus on me, focus on the destructive Radical Islamic Terrorism that is taking place within the United Kingdom. We are doing just fine!" Trump tweeted at a Twitter account belonging to a British woman named Theresa Scrivener, who has six followers and has tweeted nine times in eight years. Around 20 minutes later, he deleted the tweet and replaced it with one tagged with the British prime minister's official account, the Telegraph reports. May, who the AP describes as having "been under pressure to condemn Trump directly" while on a surprise trip to the Middle East, on Thursday called Trump's retweets "the wrong thing to do." The demagoguery continues from this ez-hole. Dark days of America with him as prez.